An exploratory adventure in Fiordland with its remoteness, steepness and dense bush holds a definite allure for those of us who enjoy that sort of thing. Since back in 2004, when we bush bashed down the Neale Burn, swimming at times up to our necks in the meandering river to avoid the near impenetrable bush on either side, packrafting seemed like the answer to Fiordland travel to me. So, with this thought in mind (and knowing that in a few months we would be racing Godzone in this exact territory), a group of trampers (myself, Chris, Nick, Dan, Georgia, Patrick) jumped aboard a watertaxi and hooned across North West Fiord in late December with a mission in mind. Unloading from the taxi proved tricky, heaving the packs up the ladder and passing them down to the shore. Team work helped... and fortunately no one fell in. As the boat driver made to leave he glared at us standing cheerily on the beach, "You take care out there... it's almost mountaineering you know!!" We decided we would heed his warning and take it carefully. We set off along the short section of track which leads to the boat shed at Lake Hankinson. There we took some time inflating our rafts and stowing gear - hopefully we would get quicker at this over the coming days. We pushed off from the shore and paddled out across the lake. Dan and Nick's boat looked ready to sink under the weight of them, with all the food and gear they had packed. After an hour of paddling we reached the head of the lake and headed up the track towards Lake Thompson. En route we had to cross two '3-wire' bridges. As I teetered across the wildly swaying bridge, my heavy pack not assisting the feeling that the whole thing was about to flip and send me crashing onto the rocks below, the boat drivers words rang in my head - this did feel like nearly mountaineering - and we were still on a track! The light grew dim and we put head torches on for the final section to the hut. It was about 11 pm by the time we stumbled inside, to the surprise of the solo tramper who was trying to get some sleep after a long day on the trail. He did not look too impressed as we tiptoed about preparing dinner, suppressing giggles and whispering as we ate. In the morning the sky looked heavy and grey and the predicted rain was clearly on its way. The tramper asked us where we were headed and once told he asked, "So, do you just use GPS and luck for a trip like that?" We replied, "Well, no GPS, but maybe some luck?" He didn't look impressed by our answer and shortly he left. We headed up valley in the opposite direction and by the time we were climbing through the heavily mossed forest the rain began. We weaved up through stunted beech forest to Henry Saddle. The pouring rain, wind and fog made the decision to skip the Marguerite Peaks and drop down the track to George Sound Hut very easy. We enjoyed a short paddle across Lake Katherine, and as the little side creeks rose to torrents we scampered down valley to the hut. It was cosy and warm in the hut and we used the fire to dry out our gear and brewed coffee while the rain poured down outside. Over night the weather grew wilder and we were very happy to have our nice shelter. The first stage for the day was paddling around George Sound into a cove about 10km away. It was still raining, but we decided to continue anyway as the forecast was for it to clear in the afternoon. Fiordland in the rain feels quite authentic and majestic, Nick decided to start counting waterfalls but quickly lost count. We packed our gear more carefully this time, hoping to keep dry gear dryer. The inflatable 'sausage' that forms the centre of the packraft proved a useful place to stow gear. It was strange to launch on George Sound and realise we were now on the sea! There was talk of sharks, but we didn't see any. We did go and look at Alice Falls roaring into the sound, all the rain having risen it spectacularly. We paddled up as close as we dared - it was like Nevis Bluff suddenly tumbling into the still water of the sea. Then we paddled onwards down the sound and round the corner into the Southwest Arm. 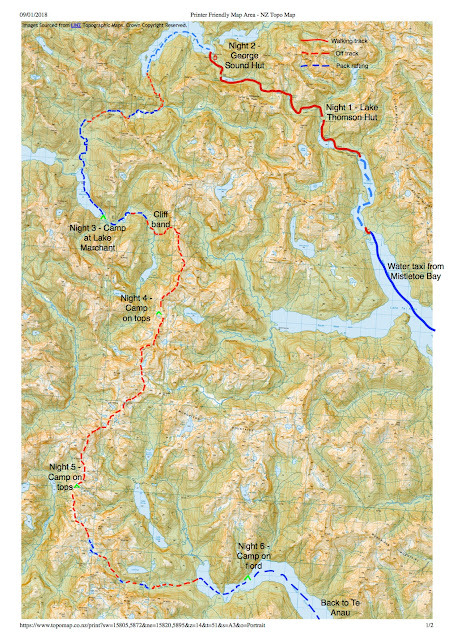 Because of the rain we had altered our route slightly, and now planned to climb up on the true left of Ethne Stream up to Ethne saddle, and from there drop down into the Stillwater River. From the cove we packed up the rafts and headed into the bush, keeping to the true left to avoid crossing the swollen river. The rain was easing as we bush bashed up the valley, but the going was fairly slow as rotten logs broke underfoot and poles occasionally poked through moss holes and revealed small chasms below. We were now completely off track. As we reached Ethne Saddle a few rays of sunlight started to glint through and the rain stopped. From the Saddle we dropped down into the Still Water River. The river was majestic - flowing deep and black from bank to bank and living up to its name. We inflated the rafts and set out down river. The thickly treed river banks floated past gently - how nice was this! After a while the current quickened and the appearance of boulders sent us scurrying to eddy out. We knew at this point the river dropped one contour line quite rapidly. As we walked beside the river we could see huge rapids, followed by an amazing 10 metre waterfall which we named ‘Stillwater Falls’, which was followed by a continued section of huge rapids. It clearly paid to pay attention to a single contour drop! Waterfall into lake... can you spot the tiny packrafters? Late in the afternoon we emerged on Lake Marchant and paddled across its calm waters in the setting sun. We spotted a sandy beach where the recently high waters looked to have just receded and decided it would make a nice camp spot. So we pitched our tents and gear exploded everywhere, as we made camp for the last day of 2017 at the far end of Lake Marchant on a sandy little beach, complete with fire, beer, plum pudding, cream and marshmallows! The boys hoped their packs might be a bit lighter the next day? In the morning the gear explosion was tidied back away, and tucked into packraft compartments where it would hopefully stay dry. We started up the Large Burn initially on foot. We reached a massive swamp and after wading through the water for a while we decided we should inflate our rafts. With nowhere out of water it proved a tricky transition... one which saw our nice little camera tumble into the swampy depths. I was pretty disappointed and Chris was too - we now had no good camera to document our journey! We would have to make do with Georgia's waterproof and our cell phones. We continued upstream, paddling some still sections and portaging our boats up the swifter parts. Travel was not fast - if we managed 1km per hour we were doing well. The plan was now to head up onto the tops where we would spend several days traversing the border of the Takahe Conservation Area in the Murchison Mountains. At lunch Georgia noticed a ‘doable’ looking line right up through the beach forest above us. There was some debate, as a nasty looking cliff line cut right through the 800m contour, however on the map the words '800m' sort of hid the cliff band from view. The forest looked okay and the decision was made to give it a go. It was slow going through the steep forest. After several hours hard work we reached the cliff band we had been concerned about. Sure enough, it was a cliff. In a typical Chris move he was convinced there might be a way through, so he went off scouting while Dan prepared us all cheese and fish wraps to up the energy levels. Chris came scrambling back and said he thought we could get up, especially if we utilised the small rope we had brought as a throw bag to haul up the packs. In three stages, involving immense pack hauling on Patrick’s part and various others dotted precariously on the cliff, we managed to get ourselves and the packs to the top. Patrick (his arborist skills coming rather in handy!) managed to create a harness out of a sling providing myself and Georgia with some level of safety as we dangled precariously from mossy trees above the 50m drop! After the third 'pitch' we plonked down on the flatter forest floor and agreed that we had now well and truly deviated from a standard tramping route. At about 5pm we emerged from the scrub on a sunny terrace and stripped off our shirts, enjoying a brief laze in the sun. But the day was by no means over - we still had to climb onto the ridge proper, up to point 1535, then along a narrow and concerning section of ridgeline to 1585 and descending a long spur to some small tarns near 1124 where we planned to camp. A bit of speed walking up the first hill the hearts going and the evening glow on the surrounding peaks and valleys was stunning. We could see across to Myth Tarn dangling precariously in its bush clad valley and the steep sides of Lake Mackinnon a long way below us. Sure enough the ridgeline became steep and narrow at one point and the mountain goats of the party did a bit of pack shuttling for those of us who weren't so confident. The tops were covered in granite slabs which made for relatively fast travel, but it was still reaching 9pm by the time we started dropping towards the tarns. Dan and Nick made up a delicious strawberry yoghurt milkshake which tasted amazing and gave everyone the energy for the last hour down to the tarn to camp. Inflating rafts when there isn't much dry land! The next morning 6 weary bodies emerged from tents and drank coffee on the rock in the morning sun. The weather was proving to be beautifully settled which was a very good thing given the next two days to be spent entirely on the tops. We still felt like we were a bit 'behind schedule' so it looked like we would have to traverse past Robin Saddle Hut and continue along the ridge - I was disappointed as this was one of the places I had been most excited about visiting... I guess we will just have to plan another trip! We sidled around Mt Irene to a magnificent tarn just below 1191. There we stripped off for a chilly swim and a lunchtime cook up of two minute noodles. We were visited on route by tiny chirpy rock wren and looking down to Lake Bloxham and the Takahe conservation area was pretty amazing. Our route had several more steep sections and there were many places where you had to watch your step - one trip could send you tumbling hundreds of metres down either side. We traversed above Robin Saddle and could see the cute little hut nestled down by a tarn below. Then we continued along past Te Au Saddle and towards 1408. At the end of another long day we struck a very steep scramble up bluffs. Chris did a scout for us and once again some good teamwork got us all safely to the top. We spent a second starry night camping up on the ridgetop high above Hidden Lake. While we were boiling up water for dinner we heard the strangest bird call, it was a very loud shrieking sound. We all looked at each other - that had to be a takahe surely... but it had come from the Hidden Lake below us, outside of the Takahe zone. 'Can they escape?' I asked, but then we all laughed as we remembered that the takahe themselves have no reason to stick in their 'zone'. We had the feeling that it was time to start to find our way out of the 'wilds' and back into civilisation the next day. Nick and Dan had a flight out of Queenstown on Friday morning and it was now Wednesday. We set our course for the Gorge Burn, one of the viable exit options we had eyed up before the trip. The weather was still holding, but had become grey and overcast with the occasional rain spot. The terrain had altered subtly and now seemed more gentle, with slightly more rounded rock and boulder fields. Nick enjoyed leading the group weaving through the maze of rock and then a scree descent into Lake Ione. We paddled across the first lake which then fed into Lake Eva. Dropping into Gorge Burn the alpine tussock mingled with stunted beech trees which released great puffs of yellow pollen all over us. There were many beautiful little camp spots in this upper valley. The bush proved good travel and it didn't take us long to reach Lake Boomerang. Nick decided he was hot and that swimming the lake rather than rafting sounded like a plan. Fortunately Dan thought it was still a good idea to inflate the raft and so when young Nick froze about half way across the lake he and Dan were able to switch spots. At the far end of the lake the Canada Geese had invaded and little mounds of poo covered the lakeshore. Chris found a small swiss army knife on the lake shore and shortly after that I found an old empty packet of peppermints and all of a sudden it felt like we were returning to civilisation. It took us a few more hours to reach the fiord, occasionally we would get stuck in bush lawyer covered tree fall and have to painstakingly clamber our way through. Popping out of the bush suddenly on South Fiord of Lake Te Anau was a bit surreal. It was a pebbly beach almost identical to the one the watertaxi had delivered us onto 5 days earlier. Paddling on the fiord was a great feeling and we whooped as we pushed off from the shore and out onto the calm fiord that would take us back to Te Anau. We found a nice sandy beach for camping and a fire with toasted marshmallows was an excellent last night on our journey. The talk was much centred around the upcoming Godzone Race in Fiordland which we were all taking part in. We felt that we had learned a lot about travel, pack rafting efficiency and general team work on this trip and there was an excited buzz that we had achieved quite an ambitious route through this rugged country. Amazing rock formations... and mordor in the background? We paddled down the Fiord in the morning, but as we hadn't done quite enough exploring, we deflated the rafts at West Beach and walked along the ancient Hidden Lakes Track. Chris and Nick got very excited, practically running the track, as the open forest and many rock features would make a stunning orienteering map. Shortly before we reached East Cove I was walking along and heard a 'whoopee' in front of me. I rounded the corner to see Chris and Nick had plunged naked into Hidden Lake from a boulder right by the track. I quickly did the same thing and before long the whole group was bobbing around in the lake chuckling and laughing. Once clothed again we walked 2 minutes down the track to come across a group of about 15 tourists who had taken the boat across - just as well they had not come a few hundred metres further up the track! We walked out to the Lake Te Anau shore and blew up the rafts for the final leg into Te Anau. We paddled strongly across the lake as a float plane glided past and the number of small boats zooming past increased. We pulled up the boats right on the Te Anau lake shore and soon gear exploded again as we unpacked everything and dragged it up onto the footpath. Nick and Chris had been nominated to hitch hike back to the car, so the rest of us lay on the shore eating salty chips and strawberries. Over tasty pizzas and beers in Te Anau we ended our journey. At the restaurant we noticed a wall to wall topo map of Fiordland and we plotted our long journey on it... a tiny little circle on a huge canvas of mountains, fiords, rivers... We had hardly covered anything of the amazing Fiordland National Park, the possibility for exploring and adventures endless, just how it should be! Loved taking part in your adventures from the safety of an armchair. Looks like a much funner route than Godzone, which, don't tell anyone, looked pretty boring. Such a beautiful place to visit, truly loved it.